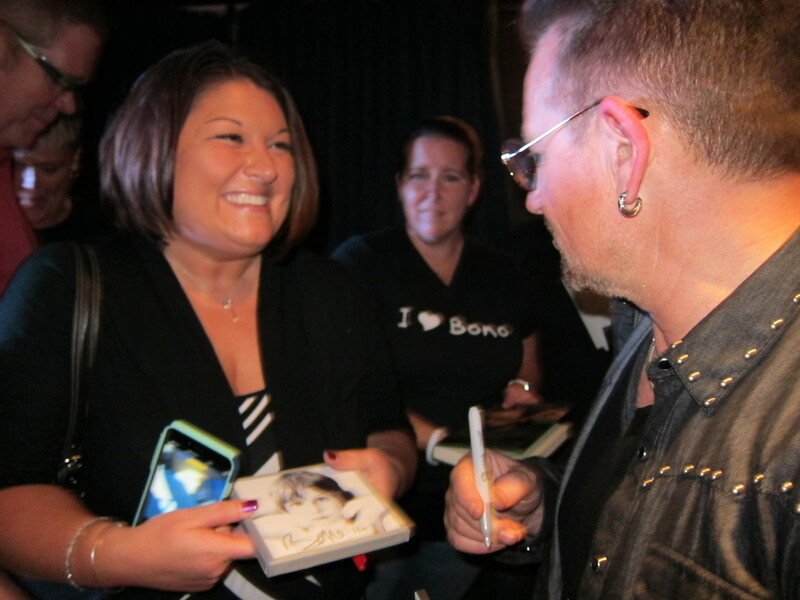 Everyone wants to know two things after you meet Bono: What did you say to him and what did he smell like? 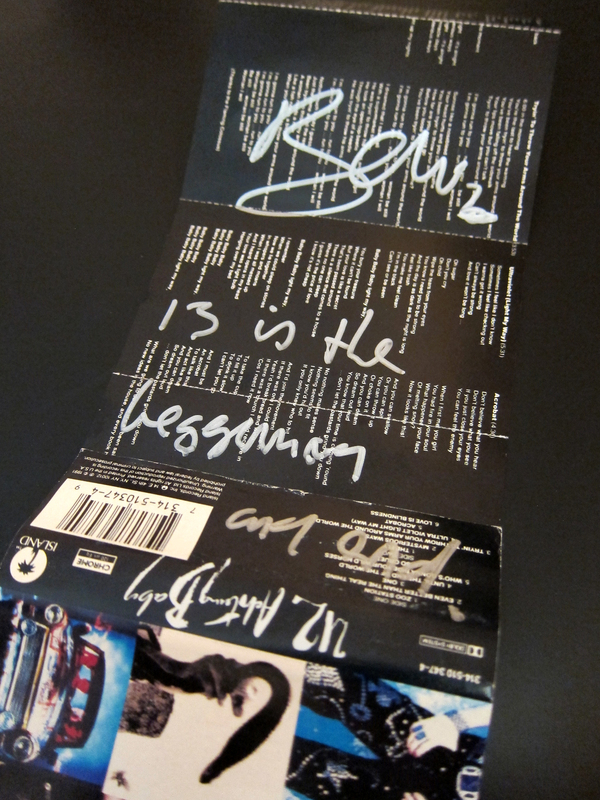 I think I may have lied to Bono, though. I have indeed dreamt many times of meeting him in my 22 years as a fan. 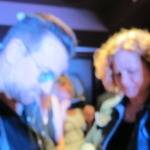 But on the night of Friday, October 17, there were none of the usual anxiety-inducing tricks of my subconscious, where I don’t have a camera, or the battery is dead, or I’m in the wrong place, or Bono leaves right before I get the chance to talk to him. This time, in beautifully lucid moments of consciousness, everything went amazingly right. I met Bono. In a swanky boutique hotel in Miami Beach. 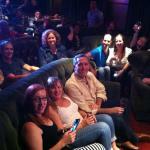 In a tiny lounge filled with a few dozen people on sumptuous tufted leather and green corduroy couches. 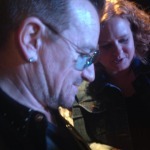 As millions listened to a live interview broadcast nationwide with Bono and Larry Mullen, Jr., I sat just a few feet away from one half of the world’s biggest band. I watched for more than an hour as the two talked with unmitigated pride about their new album, Songs Of Innocence. 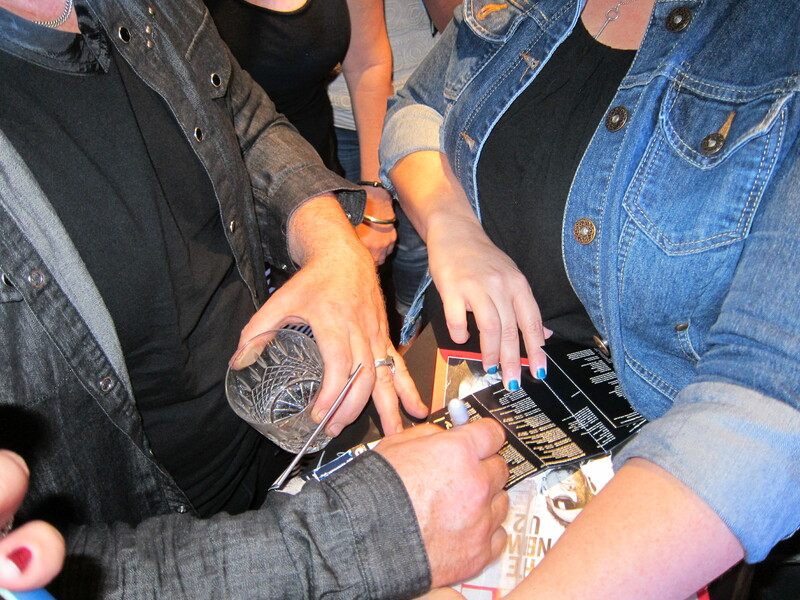 I could not have dreamed up a better way to meet Bono. 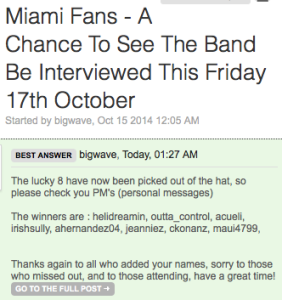 The stars started to align two days before, on Wednesday, when I learned, thanks to atU2.com’s Sherry Lawrence, of a contest in a subscriber-only forum of the U2.com Zootopia Community: “Miami Fans—A Chance To See The Band Be Interviewed This Friday 17th October.” The post didn’t divulge much else—members of U2 might be in Miami for an interview, and the fan club might have a few pairs of tickets to join the select audience. I couldn’t tell if they were being coy or non-committal. Zootopians who lived “in or close to Miami” had to post their name, age, city and favorite U2 song into the thread for a chance to win. I loosely interpreted “in or close to Miami” to include Jacksonville, where I live, just a five-hour stretch straight up Interstate 95. I typed in my details, specifying Volcano as my favorite Songs Of Innocence track, Crystal Ballroom as my favorite Songs Of Innocence deluxe version track, and Out Of Control as my all-time favorite U2 song. I had to cover all my bases. Winners were supposed to be announced Thursday morning. Between trying to figure out what time zone the U2.com moderators are operating in and wondering what constitutes “morning,” Thursday was a long day. The morning came and went. As did the afternoon. As did the evening. My mother, a long-time sufferer and enabler of my U2 habit, called me at 8:32 that night to ask if I’d heard any news. “No,” I replied dejectedly. “I’m sure they’ve notified the winners. The event is tomorrow; people have to be able to make plans.” We hung up and at 8:33 p.m. I refreshed the forum page one more time, out of an involuntary muscle response developed over the course of the day. A new post appeared. The winners were announced. I was sure these people had already been contacted and this was a formality to announce them publicly. But in scanning the string of user names, one stood out to me: outta_control. Oh. Mygod. That’s me. I didn’t know in that moment what this opportunity meant, but I knew it would be special. I didn’t know which members would be at the event, or what the event even was. And I didn’t take it for granted that I would meet them. In fact, I’d heard virtually nothing about this first U.S. stop on the U2 promo circuit. 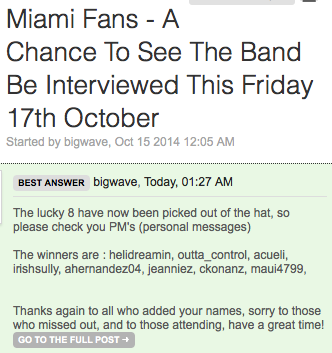 I warily envisioned driving all the way to Miami to sit at a radio station and listen to U2 call in from Dublin. At best, maybe I’d see them in person, but through the broadcast booth window. 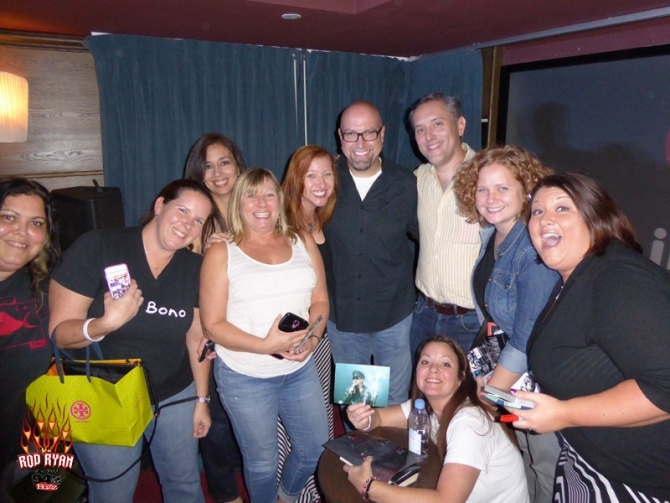 Each of the fan club winners generously got a +1. 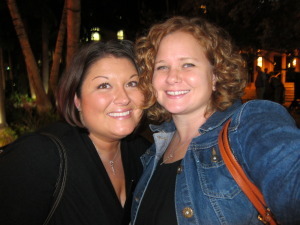 Mine was Michelle: a U2 soul mate I met before the 360 show in Baltimore in 2011. We’ve since ventured out on many U2 journeys together: more concerts, the U2 Conference at the Rock and Roll Hall of Fame in Cleveland, and an unbelievable trip out west to find The Joshua Tree a few years ago. After an excruciating 57-minute wait for her to get out of yoga and respond to my text(sssss), we were making plans for yet another adventure. Within the hour, she’d made arrangements to miss work Friday and booked a 6 a.m. flight from Buffalo, NY, to Miami the next morning. Sleep was an impossibility Thursday night—too excited for the day to come, too anxious that something would go wrong as I tried to span the length of the state and Michelle tried to span the length of the country to get to Miami. I woke up to Bono singing Song For Someone on my alarm and stared at the lyric poster hanging in front of my bed: “And you can dream, so dream out loud.” Indeed. 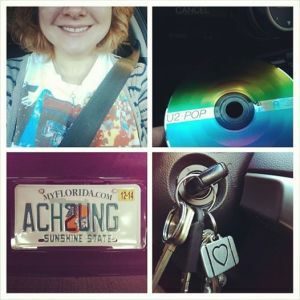 I loaded up my ACH2UNG-plated Honda Accord, queued up Pop in the CD player (Miami, obvi) and hit the road for the 345-mile drive south. In a rare occurrence of travel serendipity, Michelle and I had no delays in the air or on the ground. I pulled up to Miami International Airport right as she was stepping out of baggage claim and we spent the next half hour in the car taking turns saying, “I cannot believe this is happening.” We were pilgrims on our way. We didn’t have many details going into Friday—didn’t know where the event would be held, how many people would be in attendance, which U2 members would be there. Information was parceled out every few hours. All we knew at first was that the location would be in central Miami, then Miami Beach, then eventually we were instructed to show up at 6:15 p.m. at the Soho Beach House, where someone would meet us and have us escorted in. If we showed up after 6:30 p.m., we were out of luck. It was all very cloak-and-dagger. My brother was on Google duty as I drove down. 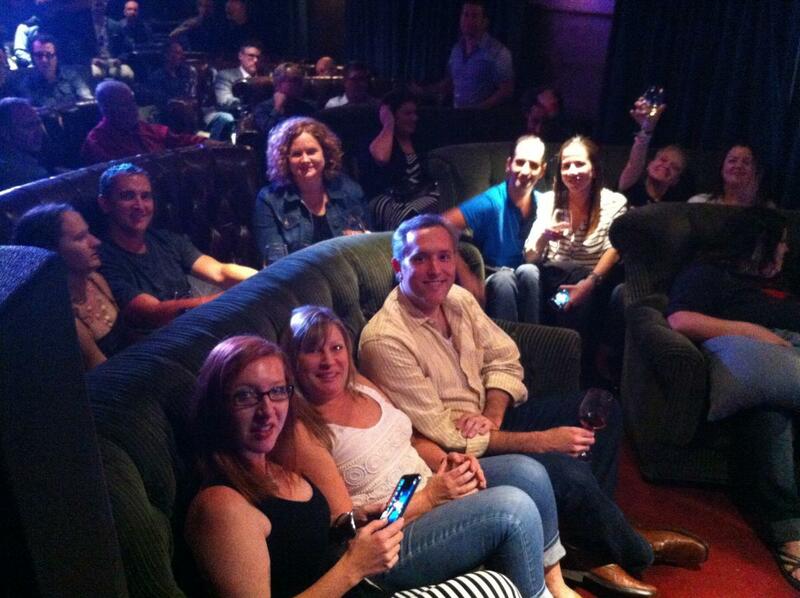 He found that the Soho could accommodate a 300-person event, but speculated I’d be in the 75-person penthouse. I scoffed. 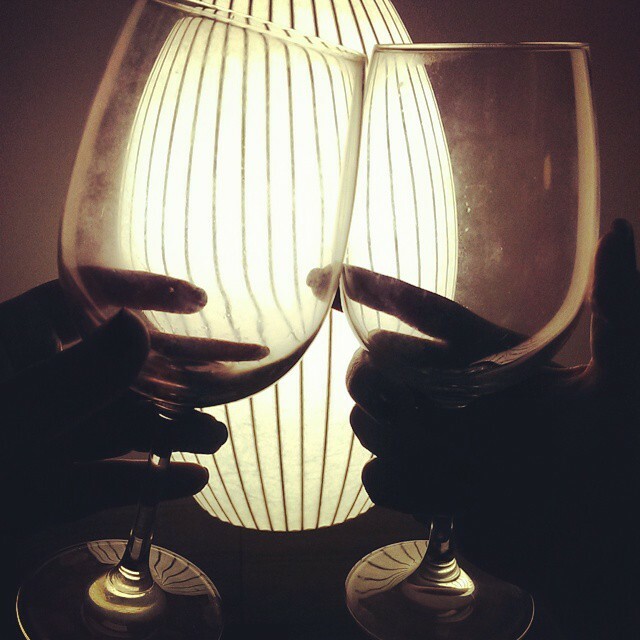 The intimacy of the evening was immediately apparent. Three stools sat at the front of the narrow, dimly lit room. 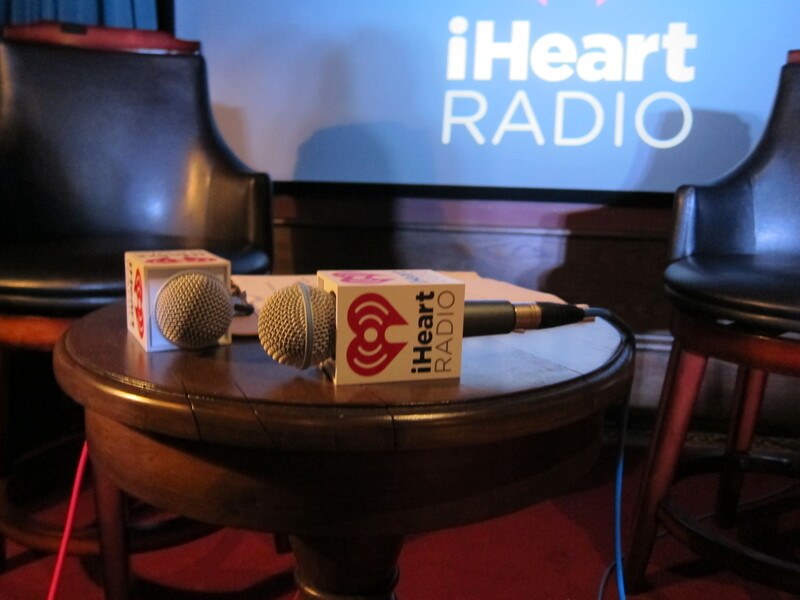 Radio host Rod Ryan sat on one, reviewing and editing his notes ahead of the interview: “iHeartRadio Icons Live: U2 The Making of Songs of Innocence.” Some other radio execs sat at the back of the room, and we joined the other 12 fans at the very front: Sylvia and Bonnie from Ft. Lauderdale, Jeannie and Melanie from Davie and Cooper City, Allen and Ileana from Miami Lakes, Jimmy and Meghan from Ft. Lauderdale, Donna and Annie from Boca Raton, and Christian and Andrea from Guayaquil, Ecuador. Yes, Ecuador. They had flown in Friday morning. A waiter brought us wine: I made a really bad joke about hoping it would take the edge off, gave Michelle strict instructions not to let me talk to Bono with red-wine mouth, and then sipped it slowly so as not to inhibit my Bono senses. We settled into our sofas and Rod prepped us on the interview. He said it would alternate between discussing the songs and playing the tracks, and encouraged us to let the world know this was a live broadcast with an excited audience. Phones were on lock-down during the broadcast (something I’m grateful for, as it ensured I gave my unadulterated attention to Bono and Larry, rather than trying to document the night), so I dug out some scraps of paper from my purse to take notes. I sat there for the next half hour, mostly stunned by where I was and what was about to happen. And then it happened: the door at the front of the room opened, the music blared, and Larry walked in smiling slyly, with Bono strutting closely behind—not rock stars taking the stage in front of 80,000 people, but two Irish blokes settling in for a drink and a chat. 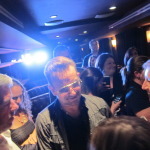 Larry sat down right away while Bono shook hands with fans on the front couches. I studied them both—everything about their physical appearances aligned with what I already knew, but this rare proximity revealed their personalities in a way I’d not seen before. Larry is at times stoic and at times hilarious, and he is undoubtedly always the coolest person in the room. Bono is a ham. He is a Shakespearean fool—not a jester juggling for laughs, but the wise and witty wordsmith. He lets us laugh at his expense but is the most intelligent person in the room—the best comics always are. He is a keen observer who quickly parlays his observations into profound insights. He reads people and situations and responds brilliantly. Bono and Larry are an infrequent but intriguing pairing for a half-U2 appearance. The most public and most private members of the band—Larry rarely opens up and Bono never shuts up. Bono and Edge are the standard duo, and have been making the rounds with some mesmerizing acoustic versions of the new Songs. I wondered if a Bono/Larry appearance meant they would not be performing, and was a little disappointed by the prospect. The live broadcast kicked in with a pre-recorded intro: “Thirty four years ago, the album Boy debuted to the eyes and ears of America. Four decades later, the world is still following.” A succession of quick clips from U2 hits played: Bullet the Blue Sky, I Will Follow, Sunday Bloody Sunday, With Or Without You, When Love Comes to Town, Mysterious Ways, Beautiful Day, Vertigo, The Miracle, New Year’s Day, The Unforgettable Fire, Electrical Storm. U2’s epic history played in my ears as the heart and the soul of the band sat before my eyes, just a few feet away. “Surreal” isn’t a big enough word. As Rod started the interview, it took my mind a few minutes to quiet, to suspend disbelief of such an unbelievable scenario, and to embrace the reality of the moment. After the next segment, Volcano played in the room while radio listeners heard a commercial break. This song was an easy and early favorite track on the main release for me. I hear an urgency and an energy that I haven’t heard from U2 since their earliest tracks like Out Of Control, I Will Follow and 11 O’Clock Tick Tock. Bono asked us, “Do you like this one? Should this be a single?” I vigorously nodded my approval. Other fans started to shout their suggestions for singles: “Every Breaking Wave!” “Song For Someone!” I thought about the track that has accompanied most of my waking moments since the deluxe version of Songs Of Innocence leaked just nine days earlier and shouted out “Crystal Ballroom!” Bono turned to me and locked eyes (please don’t faint, Beth, please don’t faint) and said, “Ah, yes. Girls like Crystal Ballroom—they like to dance. Boys, they like Volcano, because, it’s a volcano!” Then he exchanged a knowing glance and a head nod with Larry. I think the drummer likes Volcano. Every Breaking Wave played next—“Is it the piano version?” Bono eagerly asked as the song started, very excited to find out it was (and it was the acoustic version’s radio debut, according to Rod). He sang along to this one, too, as heartfelt as the recorded version. And then I saw something even more spectacular than Bono singing along to his own song: Bono quietly listening to his own song. After the lyric, “Every shipwrecked soul knows what it is to live without intimacy,” he stopped singing, closed his eyes and concentrated on the music. As the tempo picked up, he rocked back and forth on his stool. Larry stared forward contemplatively, seeming to study the song. 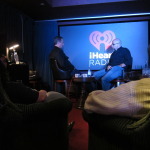 The mood lifted as the live interview returned and Rod steered Bono and Larry toward stories of their starstruck youth. Larry divulged the tale of Bono riding a celebrity tours bus and climbing walls to get closer to Bob Dylan and Brian Wilson. Bono looked on with an expression of sheepish innocence. The Beach Boys-inspired California followed, and Bono bopped along to the song, eyes open, arms in the air, as if cruising in that “beat-up, old ’57 something or other,” sometimes singing along, sometimes listening to the lyrics. After the song played, Rod asked Larry about the very personal and provocative cover of Songs Of Innocence (“Bono’s idea, of course”). Larry’s response was beautifully paradoxical. He was simultaneously guarded and revealing about a private moment that now exists in a very public realm: “It’s a big deal.” Larry’s emphatic Irish brogue was an uncharacteristic emotional burst, and summed up what every U2 fan had thought upon first seeing the cover. During the next commercial break, The Troubles played in the studio. 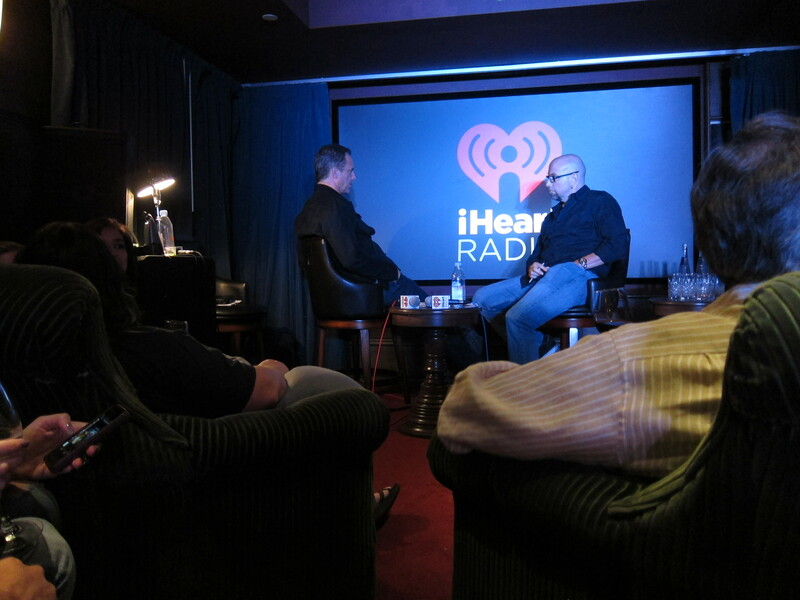 Bono praised Lykke Li as “an amazing talent,” and said of the track: “It’s not a song, it’s a spell.” Larry kept leaning forward to talk with some of the fans on the front couch near him. Cedarwood Road also played before the show went back on air. 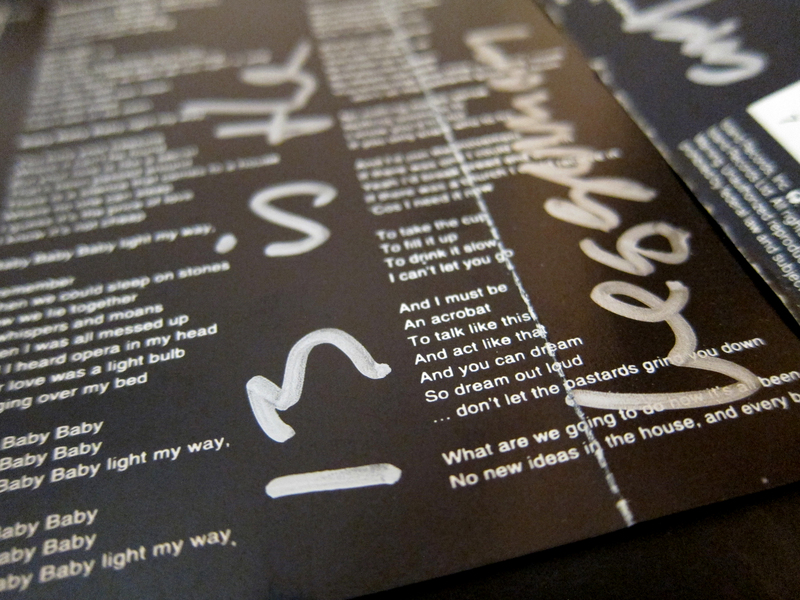 “We have to turn that up,” Bono commanded. “Can we turn that up?” The producers cranked it up and we all sang along to it together. Bono and Larry bumped mics to end the interview and everyone stood up excitedly to head to the tiny space at the front of the room. 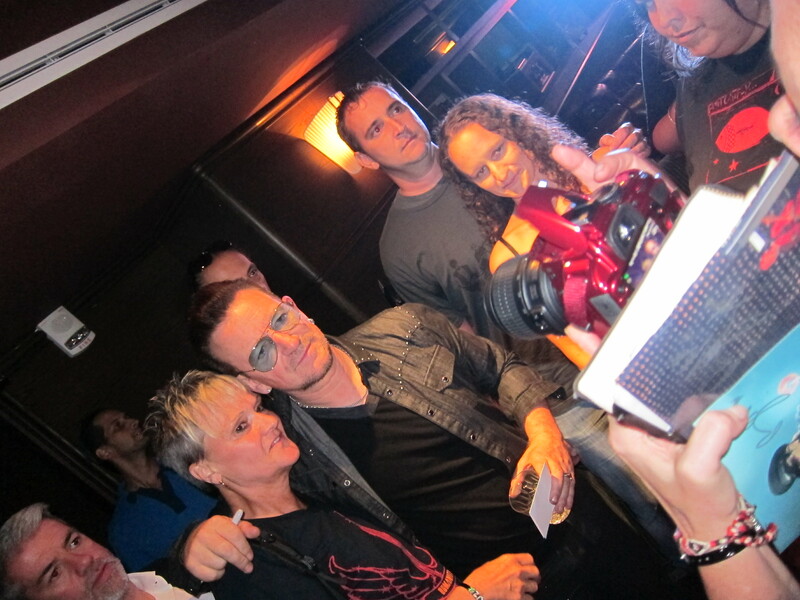 People swarmed Bono and I stood back a few minutes, just watching, my head spinning with the fact that I was finally going to get a moment with him, 22 years in the making. 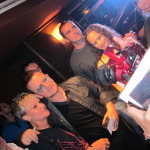 I panicked briefly when I realized Larry had already ducked out, after only a couple of photos, and people seemed to be taking a really long time with Bono. I was worried he would get ushered out before I got to talk to him and all my anxiety dreams would come true. 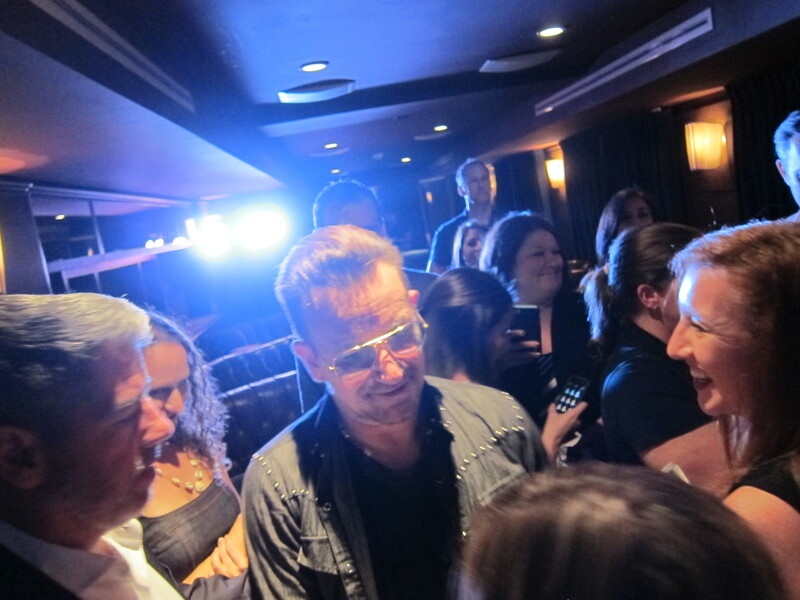 But, Bono’s bodyguard, Brian Murphy, keeps a keen eye on everything and everyone orbiting the rock star. He saw that Michelle and I hadn’t had the chance to meet Bono yet and moved some other people along so we could get in—for that, I am eternally grateful. That has to be a hard job: herding the world’s biggest and most loquacious rock star. I didn’t say anything profound. And I’ve since thought of 817 more unprofound things I wish I’d said or asked. But for 60 seconds, Bono gave audience to me. I joined the ranks of popes and presidents and philanthropists and pop stars. After more than two decades of listening to him, he listened to me. That is what he does—listens, takes what is said, appropriates it into a beautiful, Bono-fied expression and returns it to us. I said the most mundane but perhaps most meaningful thing after: “Thank you. So much.” That’s all I’ve ever really wanted to tell him. 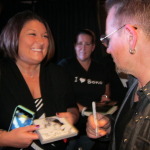 Bono turned to talk to Michelle, tickled that she’d brought a copy of baby Boy for him to sign, then he continued to make his way around the room, Brian all the while trying to lure him out. After hearing of Bono’s celebrity-stalking adventures and his mission to make Bob Dylan a U2 fan, you realize he’s one of us: just a fanboy. 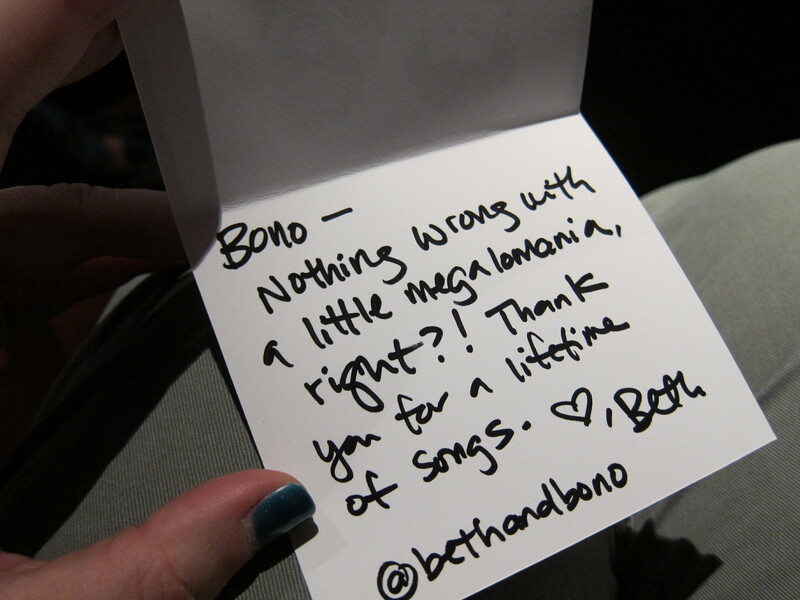 It’s not megalomania steering Bono through the room from fan to fan; it’s empathy. It was obvious how important it was to him that every fan get his or her moment. He’s not absentmindedly indulging requests for photos and autographs. He’s listening sincerely and responding intimately to everyone’s fanatic professions of admiration and adulation. I believe he would have stayed all night were he not being shepherded on to the next thing. He inched closer and closer to the door, honoring each request for his attention, before finally slipping out into the hallway, just a few feet but a million miles away from me again. 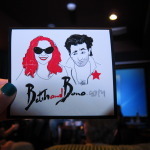 My little bethandbono.com card was still wedged between his index and middle fingers on the hand holding his empty glass. Michelle and I sat on a couch in the lobby of the Soho Beach House trying to synthesize the fantasy and reality of the evening. 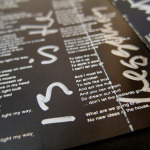 I stared at what Bono had written and thought about what he had said to me: “Thirteen is the beginning and the end. Stay 13. In so many ways.” Bono was 14 when his mother, Iris, died after suffering a brain hemorrhage at her own father’s funeral in September of 1974. Age 13 would have been the last remnant of his own innocence. The tumultuous times that followed inspired much of Songs Of Innocence. Was “stay 13” a lament at having surrendered his own innocence so suddenly and so soon? Or was Bono imploring me to stay 13, to keep the same passion and energy for the band and the music—their thirteenth studio album—as I had when I first discovered them? Or to hold fast to my own innocence? At 13, I spent hours poring over these very liner notes, discovering mantras that would navigate my own journey from innocence into experience. Now, at 35, I’m staring at them with the same intensity again. I never imagined that decades later, as I continue to negotiate between the two states of existence, Bono would pen a new lyric just for me—quintessential in its poetry and its paradox. Michelle: You had your cross-country flight booked 76 minutes after finding out I’d won the tickets. Thank you for ditching work in Buffalo and flying to tropical climes to hang with Bono and me and drink mojitos on Miami Beach. Also, thank you for capturing the most amazing moment of my life in such perfect photos. Sherry: I can’t even. Thank you, thank you, thank you. 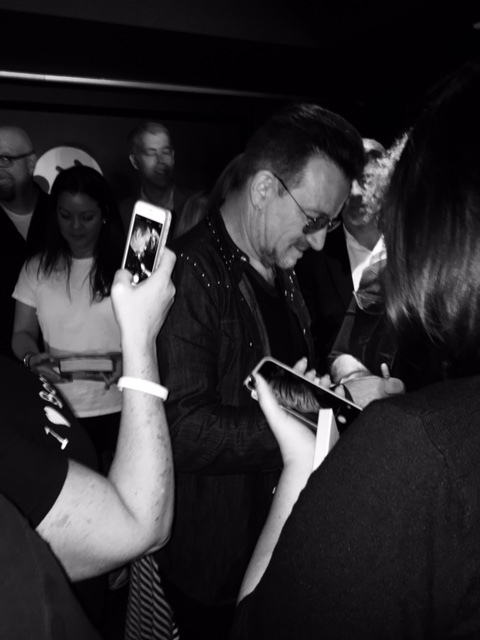 My unending thanks go to U2.com and Live Nation for creating this dream opportunity for 14 fans—for inviting us in to this intimate setting. Membership has its incomprehensible privileges. 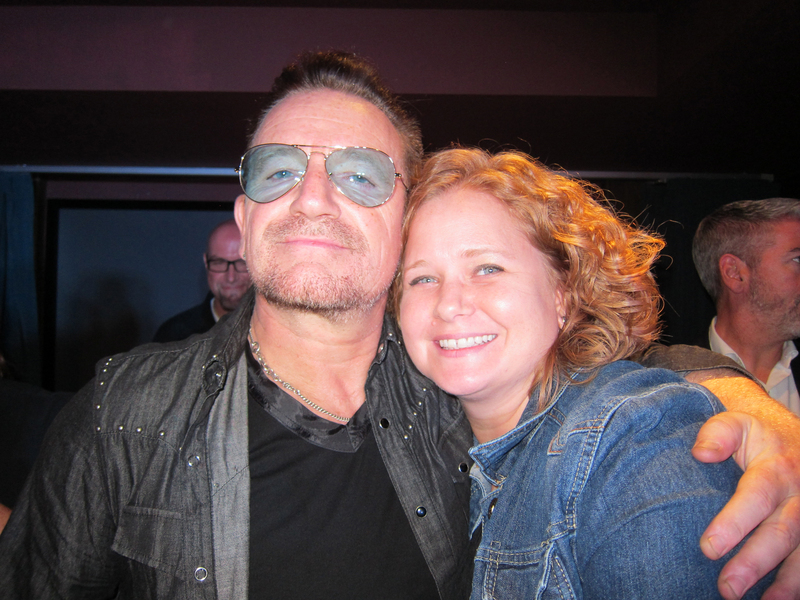 I’d resigned myself earlier this year to the notion that I’d never meet Bono, and I was OK with that. U2 are just so huge. And I am so small. My chances seemed to be dwindling, and there’s a tricky line between creating opportunities to meet your favorite person and invading his privacy. I never wanted to accomplish the former with the latter. Thank you to all my friends who know what this meant to me and shared in the excitement—and especially to Irena for believing it would happen. My big brother, Jason, has been to four of my 13 U2 concerts with me. We’ve inched our way closer to Bono from the nosebleed seats at Elevation to the outer rail at Vertigo to the front rail at 360. Friday on my drive down, Jason was there for my final push. 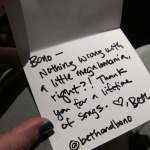 We talked on the phone for a good stretch of I-95 as he helped me find the right words to share with Bono. Last, but most importantly, I need to thank my mother. For two and a half decades, she’s put up with the U2 crazy (at times indulging, most times tolerating). She bought me the first tape, the first concert tickets (PopMart Tampa, ’97), the first fan club membership. 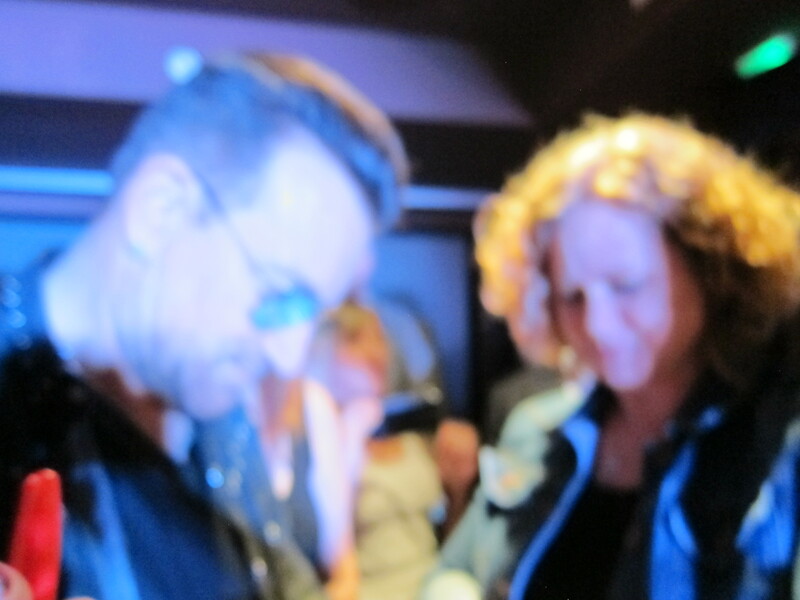 The night before the event, Mom had an anxiety dream about my Bono encounter (apparently, they’re hereditary): I’d forgotten to take anything for him to sign and she was trying desperately to find something for me. She offered someone $100 for their copy of Songs Of Innocence but they refused. That Friday, in real life, she was worried that 5 p.m. traffic in an unfamiliar metropolis would sabotage my chance to meet Bono. 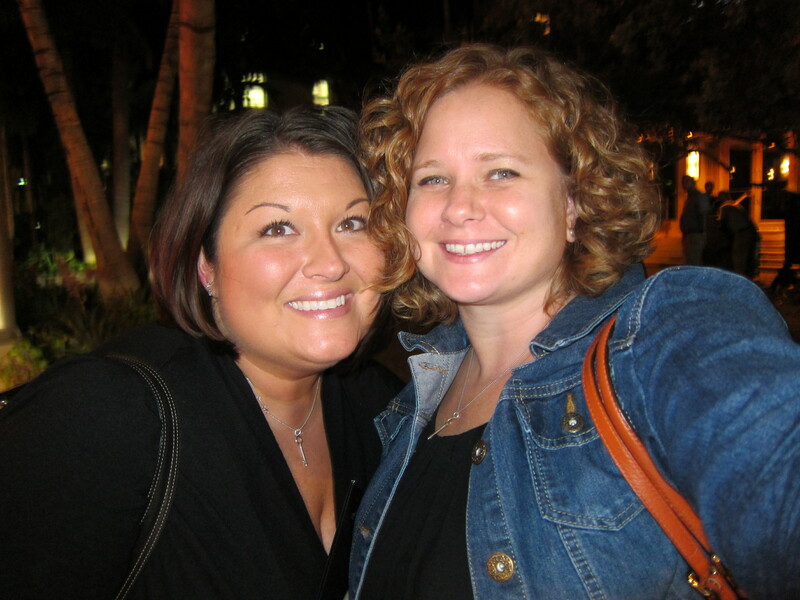 Although I’d already booked a cheap hotel by the Miami airport, she made reservations for Michelle and me just down the street from the Soho in a gorgeous oceanview room. It made for the perfect setting Saturday as we recovered from a long, hard day of meeting the world’s biggest rock star. I think Mom thinks my having reached the pinnacle of U2 fanhood means the crazy will calm down. Sorry, Mom. Probably not. I have a feeling this is just the begginning. 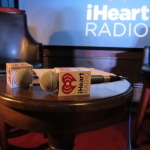 Some photos from the interview and afterparty. I cannot begin to tell you how happy I am for you being among the winners of that evening, topped by meeting the man himself. Your moving rendition of the event made me feel like I was on that couch with you, seeing it with my own eyes, feeling Bono’s eyes on me and tasting the wine on my lips. 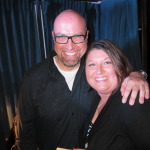 I haven’t been so lucky to meet the boys in person so far (28 years into my relationship with their music and spirit). The only ever time I shared the same stadion space with them was in 2010 in Vienna, that being a story of its own of tickets lost and ripped off over the years. I finally went to my first show and had a night to remember. Your story brought all that back to me, and the feeling of walking in your shoes for a moment. Thank you and loads of U2-love from Austria. heyo! thanks for this amazing post. 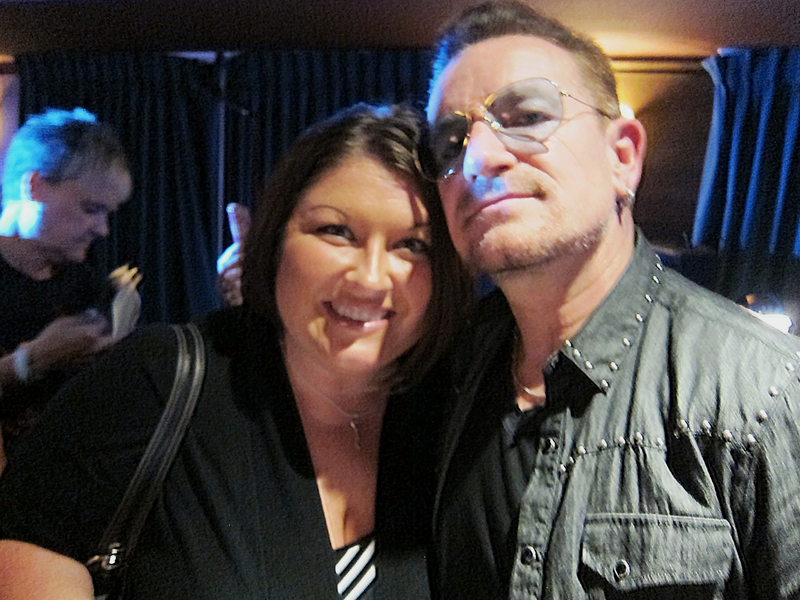 your writing is so fluid and emotional…I felt like I was meeting Bono! I’ve been a U2 fan since I was 5 (my older brother had a bit of obsession in the 90’s and passed it on to me), and Songs of Innocence is delightfully awesome. Glad you were able to realize your dream. You deserve it after you’ve worked so hard to document how awesome they are, over all these years! I just read this- with tears in my eyes. I’ve had that dream myself, but think it likely will never happen. You wrote it like it was me going through this – GREAT JOB. Thoroughly enjoyed this article. You expressed what I know I would feel if I had the chance to meet him myself. I felt like I was there. THANK YOU. I’m sorry, but you come out looking like a creep with this post. And surely Bono thought the same. ““I sometimes write things about you on the Internet”. WOW. JC- why did you read it then? You shouldn’t be sorry because it’s just your percepetion and who needs perception like that? Really enjoyed reading this Beth. 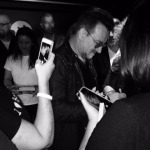 It brought back memories of some of my Bono meetings over the years (have been a fan for 30 years)and I can really relate to your wonderful experience. Also very well written, thanks for sharing! Wow!! 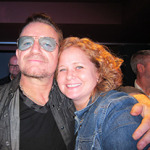 You actually lived my fantasy of meeting Bono. This is an awesome story and you wrote it so well. As I read it, I felt everything you were feeling! 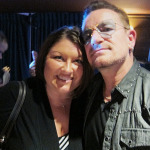 I have been a U2 fan since the 80’s and I will always dream of a chance meeting with Bono. “And you can dream, so dream out loud” right?! 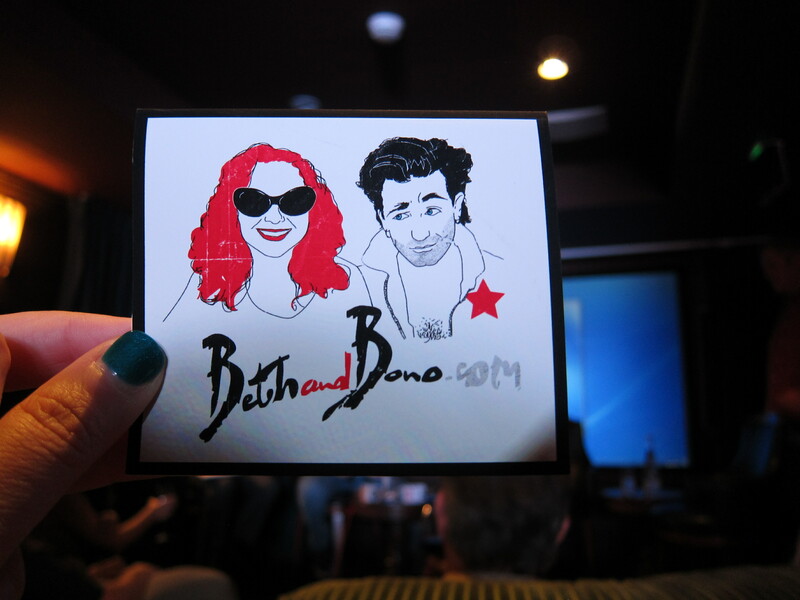 Thanks for sharing Beth, that was awesome. That gives me hope. Fan for 32 yrs. they are so great. I am thankful that they are still sharing their talents with us for all of these years. You did a great job! My brother and I have been to 10 awesome U2 shows together, and hope to make this next one. Thanks so much for giving me hope!!! I’ve been to 30+ shows and definitely counting. Had near misses outside of Barnes & Noble in NYC for U2 by U2 signing, and again outside of Rock Center after SNL performances. We met Edge and he moved my sister and I out of traffic (so nice!) and signed my Dublin tour poster. 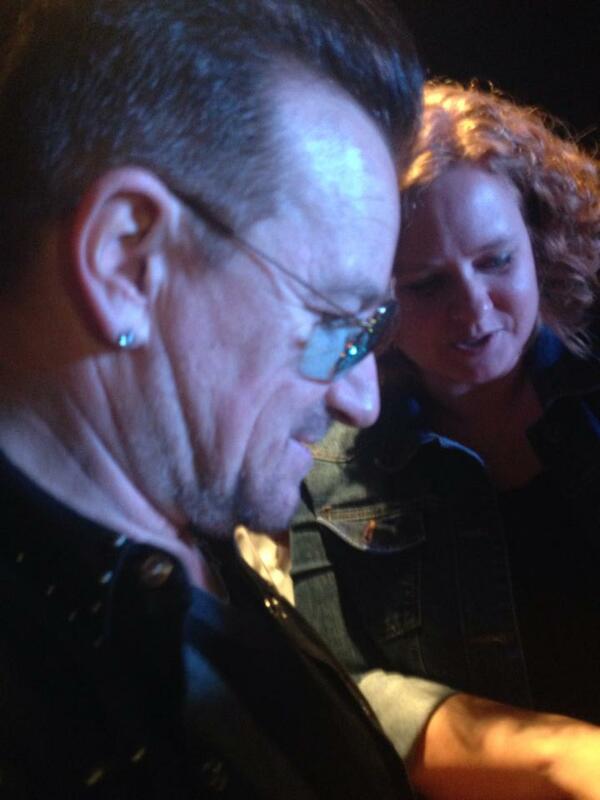 Meanwhile, my best friend ran across the street to where Bono was getting out of his car to meet and greet. She was right next to him and “had a spinal cord reaction” and grabbed (more like pinched) Bono “to make sure he was real.” Needless to say, she was hip-checked by his body guard and he was back in the car and driving away in seconds. There went my chance…all I’m left with is a remorseful friend and great “near funny with greatness” story! It will happen for me one day…I have faith. Thanks for sharing! 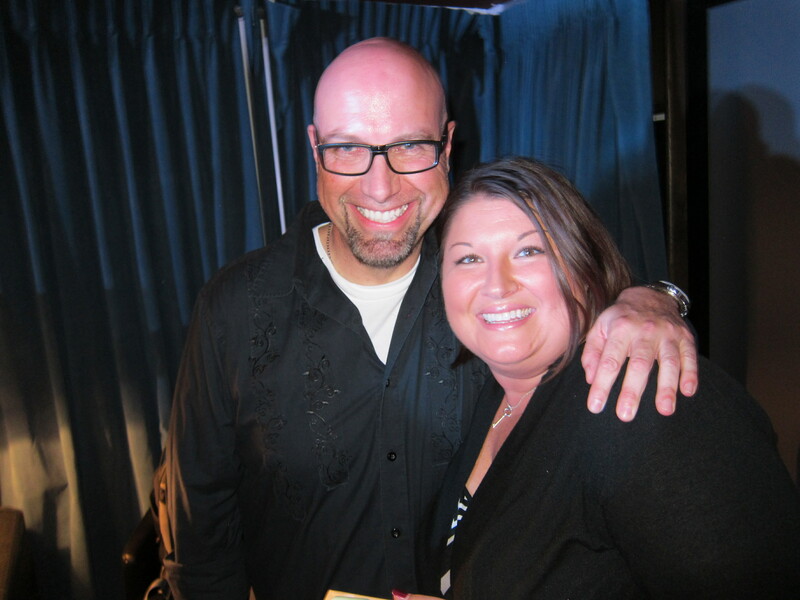 Oh and yes Beth, it is just the beginning….he is so gracious and kind so who wouldn’t want to meet someone like that again?! Loved reading your story Beth!! Love&Peace! Brilliant! What a joy to live vicariously through your experience. Certainly the journey to this moment in time must of felt “Faraway, so close…”. But I’m sure if you could you would have stayed a little longer… haha, sorry for the pun. 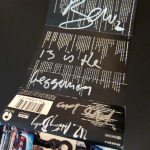 And I think Bono is right, ’13 is the beginning and the end’… thats the age I became a fan too. Something about being that age combined with the sound/experience that comes with U2 music. Glad your dreams finally matched your experiences! Thanks for sharing your experience. It couldnt have happened to a nicer person! !